When I read in a Regency about the hero giving a waif a pound, I wonder how much money that Regency pound is today. The worth of money has two parts: its value in today's money, and what you could buy with it then. Here's an Old Money to New Calculator from the British National Archives that translates yesterday's money into today's. For all of us Yanks out there, we now need to translate to US dollars. Yahoo Finance has a Currency Converter. Here, I select US dollar (USD) and British pound (GBP), setting British pound to 41.92. For May 1, the day I did the calculation, 41.92 GBP equals 70.042 USD. Since the exchange rate varies from day to day, you will get a different value on another day. The second part of the National Archives' currency converter, Buying Power, tells you what you could purchase with that Regency pound: Plug in 41.92 pounds in today's money (1 Regency pound) and select the year 1820. For 1 pound, you could purchase 6 days (craftsman wages in building trade) or the wool from 1 sheep. What does this mean? 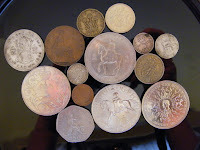 One Regency pound was a lot of money. Coins smaller than the sovereign or guinea, which I listed in my last post, Regency Money, could easily handle most day-to-day transactions. The other important fact is that labor was cheap and commodities, including food, were expensive. A Regency construction worker had to work six days of more than eight hours each to earn enough money for the wool for a suit of clothes. That Regency lord was very generous, and that waif was very lucky.